Despite the fact that the words “sell out,” are no longer allowed on The Truth About Music because of section 3.6 of the Truth Constitution, I have decided to report on some news that will probably get a trio of pop punk legends in some dire trouble with their die hards. 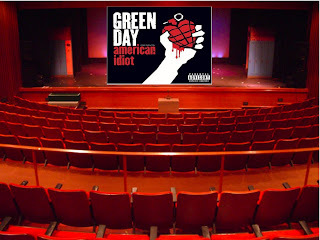 Green Day has given the thumbs up to a theatrical version of their rock opera “American Idiot,” the multi-platinum 2004 release. As the New York Times first reported, the play will be directed by Michael Mayer who won the Tony Award as the director of “Spring Awakening.” Billie Joe Armstrong always said that it was his dream for this rock opera to make it to the stage in a similar manner to The Who’s “Tommy,” did over 30 years ago. The Truth About Music is never here to simply report this news but comment on what it means to the world of music as a whole. I can already smell the carnage in the streets with the show well over five months away. “American Idiot,” the most experimental album for Green Day was met by die hard fans with very mixed reviews as the group finally shed their punk look for a more current emo/goth look. As I always will say, this wasn’t a move towards a “corporate sell out,” but instead the ability of a band to stay current in an ever changing world. “American Idiot,” was and will continue to be a defining album in 21st century, if not the most important in moving our culture into a new place in music history. Die hard fans that were offended by “American Idiots,” mere presence are sure to be rioting in the streets over the stage version when it debuts in California in September. I suppose that this whole discussion can be traced back to a few older articles I wrote. One of them ‘When Grunge Turned to Alternative, and Alternative Turned to Pop,‘ discussed Green Day and specifically this albums influence on what we know today as emo/pop/alternative rock. The other, ‘Selling Out and the Movies,’ looked into the Jonas Brother choice to embark into movies in order to spread their brand. A discussion will take place on whether this move is “selling out,” or simply a great bands dream to spread into every facet of pop culture. For the record I take the latter.